Up until now, there is a good chance that you've seen most if not all of the grapes I've written about in my "Get to Know Your Grapes" series. You may have seen them on a wine label in your favorite wine shopping spot, or seen a writeup about the grape in Wine Spectator, Wine & Spirits, or your local newspaper's food and wine section. Most of the ones I've written about so far, such as Pinot Noir, Cabernet Sauvignon, and Merlot are considered "international" varietals in that they are grown in many parts of the world. For today's effort to get more acquainted with our fruit - I turn to a grape whose name you may not have seen on a wine bottle or even heard of before - Tempranillo. Tempranillo may not be well know in all parts of the world, but I can tell you it is very well known in it's native Spain. If you happen to already be a fan of Spanish red wine you may be more familiar with this grape than you thought. By law in Europe, higher quality wines are labeled based on the wine region instead of the grape or grapes in the wine. In Spain, the two main regions that made wine from Tempranillo are Rioja (in north central Spain) and Ribera Del Duero (south of Rioja). 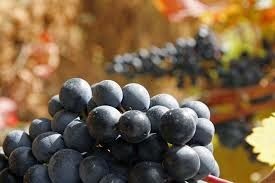 Another region in Spain - Toro, calls the grape Tinto de Toro, but it is still good old Tempranillo grapes. Spain's neighbor to the west, Portugal uses this grape in the Duoro region where they make their iconic Port fortified dessert wines. Here they call the grape Tinta Roriz. Historically Portugal has been best known for their sweet dessert wines, but increasingly you can find Port grapes like Tina Roriz used to make some very delicious dry red Duoro wines that are becoming more and more available to the rest of the wine world. There are examples of Tempranillo made elsewhere including a very nice version in Central California from Rideau Vineyard. However, at about $40 a bottle you can find much better values by sticking with the Spanish wines. Overall Tempranillo is somewhat similar to Pinot Noir and Sangiovese (the grape used in Italy's Chianti and other wines) in that they are all medium bodied, with a moderate level of acidity, moderate level of tannins, and depending on the style of the wine - some can age for a very long time. All three of these wines are very food friendly and very popular: Pinot Noir in France and the US, Sangiovese in Italy, and Tempranillo in Spain. Typical Aromas of Tempranillo. Wines made from Tempranillo typically have red fruit aromas including cherry, strawberry and plum, along with toasted oak, vanilla, spice, leather, tobacco and occasionally herbs. Vino Joven ("Young Wine") - wine meant to be drunk within the year of harvest - simple wine, aged less than 1 year. Crianza - Ages for a total of 2 years before release, with at least 6 month in oak barrels. Reserva - The best wine from good years, with a total of 3 years of aging before release with at least 1 year in oak barrels. Gran Reserva - The best wine only from exceptional years, these must age a total of 5 years with at least 2 years in oak barrels. These wines may not be produced each year if the vintage is not of sufficient quality. Wine from Ribera Del Duero use the same classifications, but tend to be darker, riper, more intense wines. Ribera Del Duero wines are typically aged in a higher percentage of new oak barrels, which has the effect of making them "bigger" wines, but because of the expense of using a large number of new oak barrels for each vintage, they also tend to be much more expensive. Let's Eat! What Food Pairs with Tempranillo Wines?. Tempranillo's higher level of acidity, lower level of tannins, and typically overall lighter body makes it a great wine to serve with a meal. Those Cheeses and Meats. Tempranillo's acidity makes it a great combination with the richness and acidity of many cheeses - especially Spanish cheese. If you've never tried Manchego cheese with a little quince paste and a swig of a great Reserva Rioja - you should! The flavor combination is out of this world and one of my absolute favorites. Grilled Meats. When the temperatures rise and you want a great red wine for grilled meat (chicken, beef, pork, lamb, everything!) that isn't as big as many Cabernets or Syrahs, give Tempranillo a try. Everything else! Tempranillo based wines, especially those from Rioja are very food friendly and can be a great choice whenever you need a red wine. With a lighter dish go with a Crianza level wine, and with a fuller bodied dish go for the Reserva or Gran Reserva level. 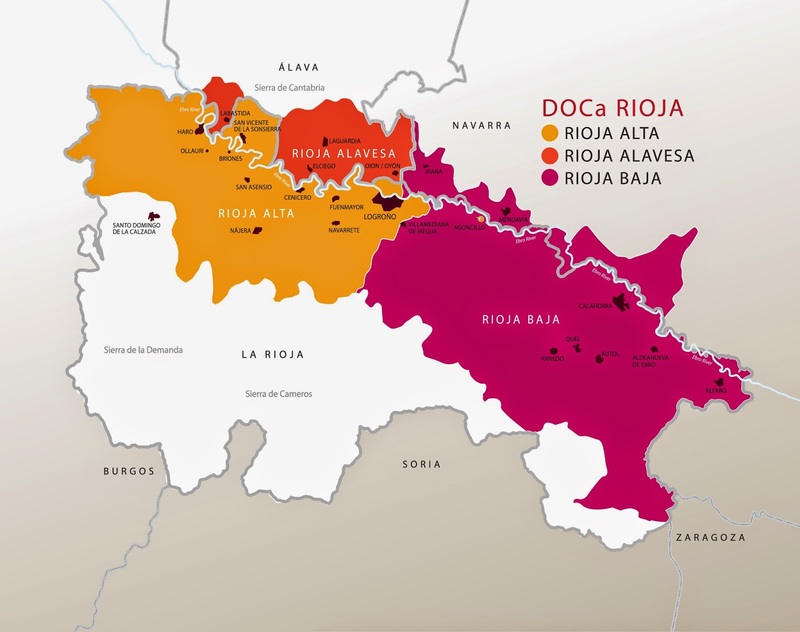 Rioja and Ribera Del Duero, Spain - Tempranillo is the star red wine grape in both of these regions. Portugal - Under the name Tinta Roriz, used in making dessert Port wine, and dry red wines. California - California wineries continue to experiment with Tempranillo. Currently close to 1000 acres have been planted in California. Other Parts of the US - Washington State, Texas, and Arizona also have some plantings of Tempranillo. Give them a try for something different, but stick to Spain and Portugal for your best quality and values. Styles May Vary. Although the amount of time a wine must be aged is controlled by wine laws (e.g. in Rioja and Ribera Del Duero), wines will vary greatly in overall style. Some winemakers will lean toward making more "Old World" wines, where the emphasis is put on creating aromas and flavors that are less fruit focused, while others will focus on a more "New World" version that are ripe and fruity in their aromas and flavors. Experiment. Try both "Old World" and "New World" styles of wine, each style can be wonderful for food and wine pairing, or just enjoying. Value. Crianza level Riojas offer some great value at between $10 and $15 a bottle. One of my go-to everyday wines is the Crianza Rioja from El Coto winery. Rioja - Bodegas Muga. One of our all time favorite wines, and our all time favorite winery to visit in the city of Haro, Spain. Try their Selección Especial for a look at how great a Rioja can be - at about $40 it is not an everyday wine, but you will not be disappointed! Muga also makes wine at all levels of Rioja that are typically outstanding, including their Gran Reserva level Prado Enea wine. Rioja - Ramón Bilbao. This brand may not be the easiest to find, but I've always been pleased with their wines - especially at the Reserva level. Rioja - Bodegas Baigorri. Even more difficult to find, I first tried this wine on our last trip to Spain and loved it! I am looking forward to our next Spain trip as we have scheduled a tour and get to try even more of this great stuff! Ribera Del Duero - Emilio Moro. I am a big fan of Emilio Moro's Ribera Del Duero wines, but they can be a little expensive (from $20 to $150). Recently I discovered their Resalso, which is their value priced offering. At around $15 a bottle - it is a great way to try some Ribera wines without breaking the bank. Ribera Del Duero - Alonso del Yerro. Not always the best way to find good wine, but I ordered this at a restaurant in Spain only because Alonso is my wife's maiden name. Well, relations or not (most likely not), these are some great wines.